A few weeks ago, I had some severe chest pain, so I left work early to go to urgent care. The chest pain was on the left side, so I was concerned that there could be something wrong with my heart. They did an EKG and an x-ray and found that my heart was perfectly healthy. Turns out that I had probably pulled a muscle in my chest by singing. Weird. The whole incident scared me. It is interesting how much of a difference such a small part makes. 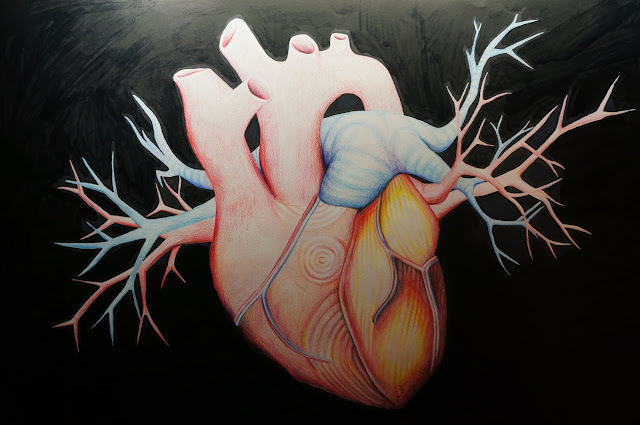 I was inspired to start project that would help me think through the concept of the heart and heartbeat. 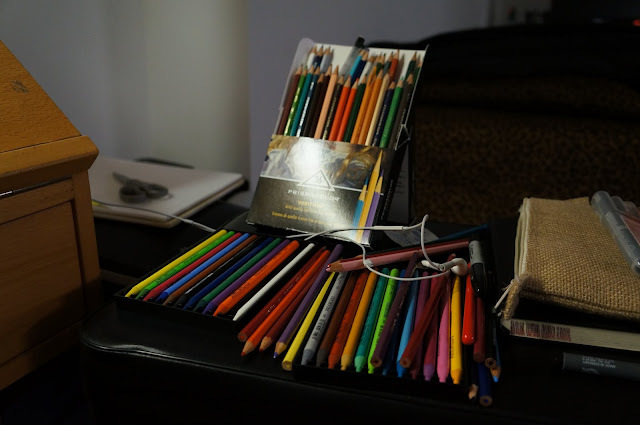 I used mostly color pencils. 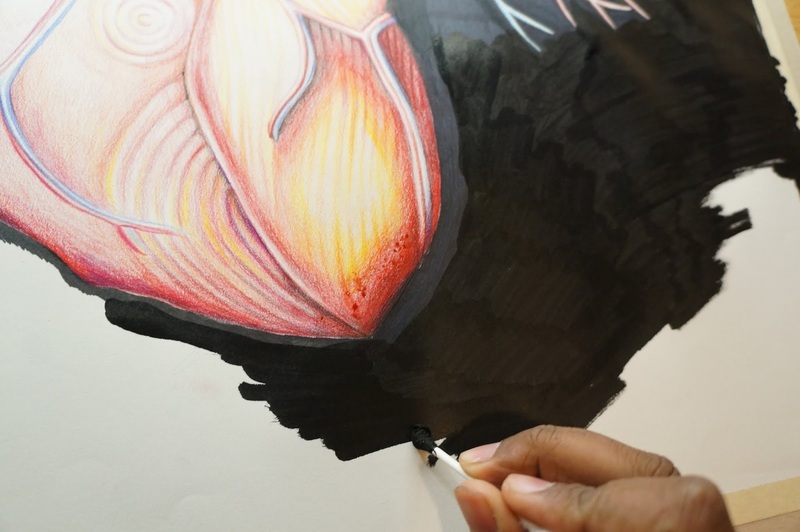 I used the Prismacolor Verithin Colored Pencils and the Koh-I-Noor Progresso Woodless Colored Pencils . I just recently got the woodless color pencils. I'm sure that I'll be using them some more. 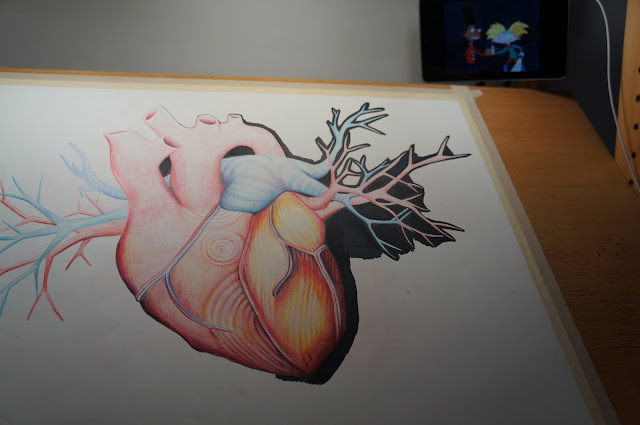 And, yes that is Hey Arnold! playing in on the screen. I have rigged a GPS holder onto my drafting table, so that it can hold my tablet on the upper right corner. Now I can draw even longer with the power of awesome cartoons from the 90's. I honestly don't know how kids these days are putting up with the Annoying Orange... Don't even get me started. I used a cotton swab, dipped in India Ink to cover all the black areas. Brilliant! Great job; the black is striking.